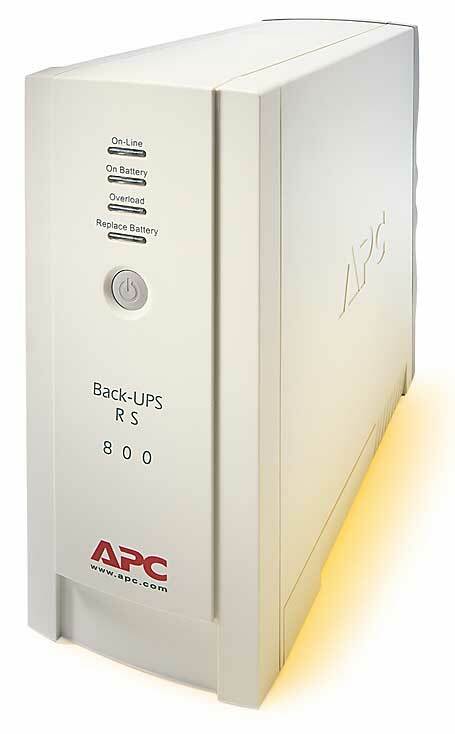 APC's Back-UPS RS 800VA provides added PC protection. American Power Conversion's $190 Back-UPS RS 800VA can protect the equipment of everyone from business users to home theater owners, with 540 watts of backup power. It features seven surge-protected outlets (four with battery backup) and comes with APC's automated-shutdown software, PowerChute Personal Edition. Unlike less-expensive uninterruptible power supply units, the RS 800VA also provides automatic regulation for undervoltage conditions, which offers an extra safeguard for expensive electronics. Setting up my shipping unit was a snap. After plugging it in for more than 8 hours (the time APC recommends to fully charge the device), I attached the included USB cable and connected it to my 2-GHz Athlon XP 2400+ test computer, my power-gulping Panasonic PanaSync E21 monitor, my cable modem, and my D-Link DI-604 four-port broadband router. Next I installed PowerChute, which recognized the UPS and estimated my battery backup run time at 15 minutes (plus a 5-minute reserve). The software also offered options on how much reserve to leave before shutdown in case of a power failure; I selected the unit's 5-minute minimum option. I pulled the wall plug and continued computing. My PC ran for 15 minutes and 30 seconds before the RS 800VA elegantly and safely closed all of my documents and then shut down my system. To further test the unit's mettle, I tried plugging more peripherals into a separate power strip, which I plugged into the RS 800VA. When I attached my big-draw laser printer, PowerChute popped up an on-screen warning saying that I was exceeding the power rating--a nice touch. Power surges and outages can impair productivity and damage expensive equipment. APC's Back-UPS RS 800VA is a nicely designed, relatively inexpensive way to buy some insurance for the next time power problems strike.